Deputy Defense Minister calls for end to incitement by Arab Members of Knesset. The 17 year-old son of Father Gabriel Nadaf, a Greek Orthodox Priest who supports the State of Israel as well as IDF recruitment of non-Jewish Israelis, was violently attacked in Nazareth Friday night. Channel 2 reports that a 21 year-old suspect approached the youth outside his Nazareth home at about 7:00 p.m. Friday night, spewing insults before physically beating him with a rod. A statement from the Defense Ministry has identified the attacker as an activist from the extreme-left Hadash party. The suspect was arrested by 3 police squads in the Arab-Israeli city and sentenced to 3 days of house arrest. A restraining order has also been issued. Meanwhile, Nadaf's son was admitted to the English Hospital in Nazareth with multiple bodily and head injuries. Father Nadaf stated to Channel 2, "While I call for integration of our sons into Israeli society, extremists are trying to divide [Arab society] and incite [hatred] against me." Nadaf said that the latest incident crossed a red line. "Their purpose is to intimidate me and my family," he stated. "My wife will not leave our home, and my other son, the 15 year-old refuses to go out for fear that extremists will hurt him, too." Deputy Defense Minister Danny Danon met Saturday with Father Gabriel Nadaf in a show of the state's solidarity with the Father's family and his efforts on behalf of the IDF. After the meeting, Danon called on Israel's Internal Security Minister to stop the incitement of Arab MKs in general, and attacks on the Nadaf family in particular. "The words have become deeds - the incitement of Arab Knesset members must be stopped," he stated. "The situation [has gotten to the point] where Father Nadaf and his family, and Christians who want to serve in the IDF in general, live in fear and suffer from attacks and harassment." "This is unacceptable, and we must take drastic action against the instigators and perpetrators alike," Danon concluded. Arab MKs have been particularly active in incitement campaigns against Israel, including participation in last week's "Day of Rage" against the Prawer plan. That plan evacuates illegal Bedouin settlers from land grabbed illegally from the State of Israel, and relocates them to legal, designated areas. Arab parties allegedly partnered with Leftist groups to initiate the protests, which saw police forces injured. 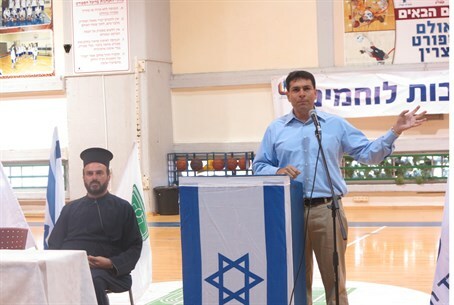 Nadaf in particular has been targeted for his success in encouraging Israeli Christians to engage in national service. In August, Father Nadaf met with Prime Minister Binyamin Netanyahu despite death threats to discuss means of encouraging more recruitment within the Arabic speaking community. More than 500 Israeli Arabs have enrolled in National Service programs so far this year, and at least 100 are known to have enlisted in the IDF. Israel is the only country in the Middle East with a growing Christian population, as ancient Christian communities throughout the region face violence and intimidation by Islamist groups, particularly in the wake of the string of uprisings throughout the Arab world. A small number of Israeli Christians annually enlist into the IDF or sign up for national service, but regional upheaval has caused many young, Arabic-speaking Christians to challenge anti-Zionist trends within their community.